It took two attempts to make good on a six-year promise that was finally kept just below the roof of the world. On March 14, dog musher Von Martin of Chehalis and his team of sturdy, “geriatric” dogs finally arrived in Nome after their second attempt to travel over 800 miles of the vast Alaskan wilderness. In 2005, Martin promised his beloved Alaskan Malamute, Wolfie, while she lay on her deathbed riddled with cancer, that he would take her ashes with him on the 800-mile ’25 Serum Run Expedition from Nenana to Nome, Alaska. “We’re going to go to Nome someday,” Martin told Wolfie through tears the day she died. It was Wolfie who had kindled Martin’s interest in mushing 12 years earlier. During that time, Wolfie progressively introduced Martin to the world of mushing — snow travel with a wooden sled towed by dogs. Over time, Martin slowly acquired a pack of howling, energetic, northern breed dogs. Sled dogs. “It was probably (Wolfie) who brought me into sled dogging,” Von said. But even Wolfie’s spirit wasn’t enough to guide Martin and his dogs through the severe Alaskan elements they encountered in their first Serum Run ‘25 attempt in 2009. They and other expedition mushers were forced to abandon that year’s run without reaching Nome after severe weather separated them from their support teams who became bogged down by unusually heavy snow. They would just have to try again. So they did. 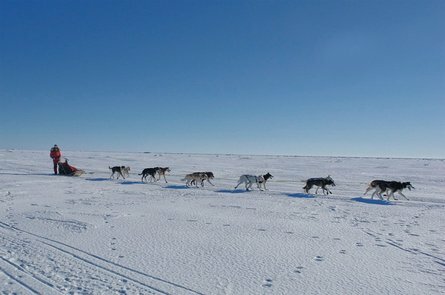 Martin and his team of dogs finally made their destination on their second attempt this year, despite delays and threats of natural disasters. The tsunami created by the March 11 earthquake Japan threatened to buckle the sea ice they were sledding across in Norton Sound. Bitter cold, and frequent, wind-blown white-outs on the “huge, featureless landscape” of Alaska’s frozen lakes and rivers all had to be overcome as well. Ironically, Martin and his dogs were even delayed when they became entangled in a piece of heavy-gage wire in the middle of the wilderness — the same wire that was originally used to communicate the diphtheria outbreak in Nome to the outside world in 1925. Despite the obstacles they encountered on the second expedition, Martin and his dog team were finally able to fill his promise to Wolfie. For Martin, his promise and his love for his dogs provided the determination he needed to complete the run. Along the way he and his fellow mushers also filled a philanthropic purpose of the expedition: to bring “health education to the villagers across Alaska,” Martin said. Each Serum Run ’25 delivers a different message to the isolated villages along the route. “This year it was suicide prevention education,” Martin said. For Martin, mushing is all about the dogs — his life is literally in their paws. Their enthusiasm is a fire that must constantly be stoked for the team to be successful. It’s a relationship that needs regular reassurance. On one stretch of the Serum Run between the villages of Galena and Ruby, the team made a wrong turn due to a missing marker, forcing them to turn around and make up lost ground. “When we had to backtrack the dogs just got really discouraged,” Martin recalled, because by that time they had been traveling 12 hours and it was almost 40 below zero. “They just decided just to stop." Martin’s job was to let the dogs know they hadn’t failed, but instead had delivered him exactly where he wanted to go. He set his “snow hooks” that anchor the sled in place, and walked up and down, speaking encouragingly to each individual dog. He decided to camp right on the trail for the night. “You can’t let the dogs think they’re failing,” he said. 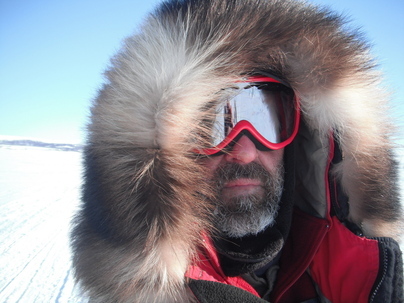 Finally, after 23 days in the Alaskan wilderness, Martin and his team arrived in Nome. There at the finish line he spread in the snow some of Wolfie’s ashes that he had carried on both expeditions. “That journey was finally complete,” Martin said. "Serving the Greater Lewis County Area Since 1889"